I am sure you have heard of Pay Per Click advertising (PPC for short), Im sure you have heard of it because it is one of if not the most popular ways of advertising on the internet. Millions of people and businesses are using PPC advertising to drive highly targeted traffic to their websites and promote their online or even offline businesses. PPC advertising is a great way for anyone to drive highly targeted and effective traffic to their website. But, I know what you may already be thinking. There are already two gigantic companies that sell PPC advertising (Google and Overture). And yes, you are right these companies are huge and you probably have no chance competing against them. But guess what, you dont have to! People trying to sell computers, wedding dresses and even pornographic websites. You dont have to sell traffic to everyone. Your PPC search engine can be a lot more targeted at a specific niche, or a specific geographical area (like your home city for example). And why would someone choose to advertise in your PPC search engine as apposed to say Overture? Because yours will be a lot more targeted! your traffic will simply be more targeted, which translates into being more profitable! Exactly how to choose the perfect PPC search engine theme for you, and why choosing something you like or are passionate about can be a very profitable decision. A list of great resources to find targeted e-zines you can promote your PPC search engine in. A complete list of everything youll need in order to start your own highly profitable PPC search engine. So, if you are looking to start your very own highly profitable PPC search engine PPC Profits is for you! But of course if you decide that PPC search engines are not for you once you have already set up one of your own. You can always sell it for a huge load of cash and make big profits from the sale. And to help you do that, just in case you decide that this is the profitable path you are going to take. I am throwing in a special bonus on how to sell your business on eBay absolutely FREE! This bonus will come in extra handy if you would like to sell your PPC search engine on eBay after it is created. In this simple, straight to the point little eBook, you will learn exactly how to sell your online business for as much money as possible, all the critical reasons why some businesses sell for thousands and other barely fetch a hundred bucks and much, much more! 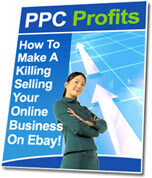 Thats right, you get the PPC Profits e-Book PLUS the wonderful bonus on selling your PPC search engine on eBay! But hey, I realize that as great a deal as this may sound you can never be 100% sure when buying a guide to making money on the internet. GUARANTEE: Get the PPC Profits guide right now and read it over. Try the information out. If you are for any reason at all not 100% satisfied, send me an email within 90 days after purchasing, and I will personally refund every penny of your money, no questions asked. It's as simple as that. Remember: this guarantee means that if for any reason you are not 100% satisfied with PPC Profits, all you have to do is send me an email and you will get a prompt, 100%, no questions asked refund. You have absolutely NOTHING to lose! With the above guarantee the risk is 100% mine not yours. So why not give PPC Profits a try right now! within just a few minutes from now! and with the help of everything taught in PPC Profits you can be well on your way to making a fortune with your very own PPC search engine! so if you like, you can use the info in PPC Profits to create as many PPC search engines as you want as fast as possible and sell them for huge amounts of profits!